Film festival believes in giving back to the community by highlighting other important non profits. The MDIFF-H opening night feature is 13 HOURS: The Secret Soldiers of Benghazi, which is based on a true story. The films follows six members of a security team, all previous veterans, who fight to defend the American diplomatic compound in Benghazi, Libya after waves of terrorist attacks on September 11, 2012. The film stars James Badge Dale who will also be at the opening night event. The film's executive producer is Scott Gardenhour, of Smithsburg, Maryland. AMVETS provides support for veterans and the active military in procuring their earned entitlements, as well as community service and legislative reform that enhances the quality of life for this nation’s veterans and citizens alike. AMVETS is one of the largest congressionally-chartered veterans’ service organizations in the United States, and includes members from each branch of the military, including the National Guard and Reserves. 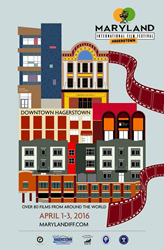 The Maryland International Film Festival-Hagerstown is a 501c3 dedicated to providing a platform for non-profits and organizations to further their mission through the celebration of film. We believe through film you can promote a greater cultural understanding, philanthropy and volunteerism within the community. The film festival donates some of our proceeds to non-profit organizations in and around our community. For more information about the Maryland International Film Festival-Hagerstown and purchasing tickets log onto our website at http://www.marylandiff.com.